A theater festival, a sold-out Nazareth concert and exhibitions of Warhol, Paradjanov, Goncharova and Bakst. From Feb. 10-15, the Moscow Meyerhold Centre is hosting a festival to mark the 140th anniversary of its namesake’s birth, theater director Vsevolod Meyerhold. The exhibition includes the Meyerhold and Rodchenko avant-garde poster exhibition and a series of productions by Russia’s leading contemporary directors, including Mindaukas Karbauskis, Ivan Vyrypaev, Boris Yukhananov, Yury Butusov and Andrey Moguchy. The festival also has an academic component — a conference for theater historians and directors. Andy Warhol’s Ten Portraits of Jews of the Twentieth Century (from the Blavatnik family collection) go on display at Moscow’s Jewish Museum and Tolerance Center. The silk-screen portraits are of scientists, writers, artists, musicians, philosophers and politicians, including Sarah Bernhardt, the Marx brothers, George Gershwin, Albert Einstein, Franz Kafka, and Golda Meir. The curators have brought together a vast amount of archive material – photographs, interviews and videos – related to each portrait. The exhibit is just the latest event that plays to Warhol’s popularity in Russia. Moscow’s ARTPLAY Design Center is planning a major Warhol exhibition in April, which will subsequently be shown in St. Petersburg. The life of Sergei Paradjanov (1924-1990) – he great Ukrainian-Armenian film director responsible for such internationally acclaimed films as “Shadows of Forgotten Ancestors” and “The Colour of Pomegranates” –– was marked by tragedy. The Soviet authorities jailed him on trumped-up charges (for homosexuality), he was denied access to film projects and prevented from working. Moscow’s Solyanka Gallery presents an exhibition to mark what would have been the artist’s 90th birthday, showing Paradjanov’s works along with a vast array of archive material. The gallery is hosting a Paradjanov festival to run concurrently with the exhibition. It will show films by and about Paradjanov. 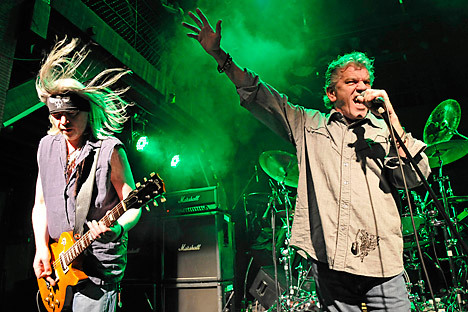 British hard rock group Nazareth will perform at Crocus City Hall. There appears to be no truth in the rumor that circulated around a few years ago that the group would be making no more appearances after a farewell tour of Russia. The group is now 45 years old but is continuing to tour and record new albums. Russians are big Nazareth fans. The group’s first visit was in 1989, when they played to packed houses at all six of their concerts at the Olympic Stadium. The frenzy may have died down a little these days, but the concert on Thursday will be a sell-out. The Natalya Goncharova and Lev Bakst exhibition at Moscow’s Nashi Khudozhniki (Our Artists) Gallery is entitled “Working on Patterns.” Both Bakst and Goncharova worked for Diaghilev and the Ballets Russes. Even so, Bakst the symbolist and Goncharova the avant-gardist, represent quite different trends. Rather than their work for the same company, it is their applied art that unites them – theater costume, interior design, textiles and book illustrations.